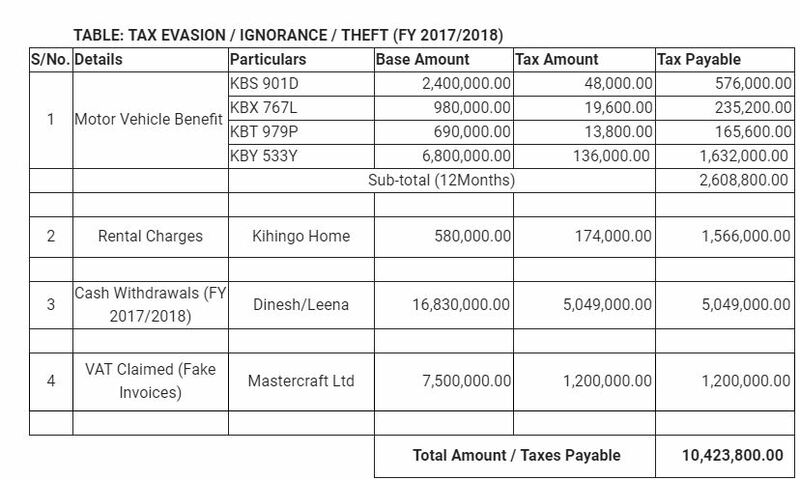 Energy solutions company, Lean Energy Solutions is facing allegations of tax evasion and employee mistreatment, Kahawa Tungu can reveal. According to information in our possession, the company allegedly has deprived the government over Ksh10 million worth of taxes from vehicle imports, rental charges and VAT claims. Information shared by inside sources. The company is also accused of being involved in several underhand deals including mistreating its employees and using their names to gain money by false pretense. In one of the case, the company accused an employee (name withheld) of stealing its briquettes and filed an insurance claim. Sources within the company say that the management colluded with logistics person(s), but failed to mention them in the details of the claim. However, as the employee intimates to Kahawa Tungu, it was a plot by the company to fire him since he knew ‘too’ much about the company’s dirty deals. “Dinesh (Tembhekar), you have forced me to severe mental torture, incur huge losses, my family to suffer a lot and to incur unnecessary costs. Am knowingly and confidently sure that nothing have stolen from you neither your company (sic),” reads a letter by the employee, addressed to the company owner. Lean has also been involved in business with Muhoroni Sugar, a company that is facing escalated graft allegations with Indian companies. The company is said to have done fuel audits for Muhoroni several times, but Kahawa Tungu could not independently conclude whether it was clean business or not.